Dr. V from the pet-friendly blog PawCurious is putting on a "Blog-A-Thon" to raise money to buy (and train) a service dog for a young boy named Bradyn - you can read about him here. Dr. V's has a strong online following, thousands of daily readers and I'm happy to be able to contribute in a small way to the greater good - and really it's a super cause. Let's all raise lots of money for Bradyn!!! You may have seen dog agility on TV - perhaps on ESPN's incredible dog challenge - or maybe even part of a national event such as the Eukanuba Invitational on Animal Planet. Agility on a basic level is a course of obstacles on which a dog and handler team navigate the course, the challenge of the course increases at each level of training and competition. In competition the fastest team to successfully complete the course wins! There are several different agility organizations: AKC, USDAA, CPE, UKC and a few more servings of alphabet soup for other venues. The basic equipment is pretty similar across those organizations: Jumps, weaves, tunnels, an a-frame, a dog-walk, a teeter (or see-saw) and a table. In all competition venues dogs are penalized for knocking (or dropping) jump bars, missing contact-zones (the yellow part of the a-frame, dog-walk and teeter), refusals and wrong courses. Golden Retriever Murphy over a broad jump! Weave poles are one of the hardest thing to teach beginner agility dogs (and their people). 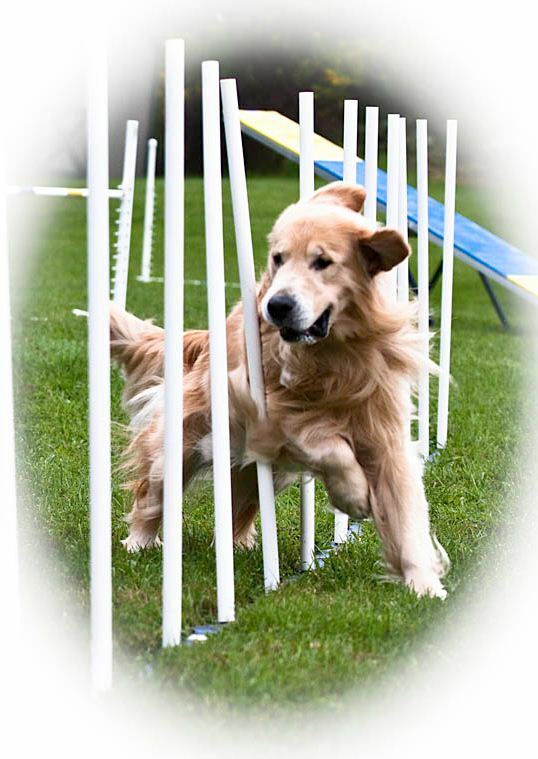 In the beginner levels of competition dogs weave through 6 poles - in more advanced levels dogs weave through 12 poles. Dogs must enter the weaves with the first pole on their left - regardless of the direction they are approaching the weaves - the ultimate goal is to teach dogs to find that same entry every time they're asked to weave - even when they are galloping full speed at the weaves on-course. There are two kinds of tunnels: Open Tunnels and Closed Tunnels (chutes). Open tunnels are 22" in diameter and come in varying lengths from 10' through 20' and can be made of any color (or colors). Closed Tunnels (chutes) consist of two parts - a round barrel type opening and a fabric skirt which the dogs must run and push through. Regulation heights of a-frame vary by venue (and in some cases by size of the dog) between 5'0" and 5'6" at the apex. Each side of the a-frame is nine feet long and 3 feet wide. Some venues require slats. Traditionally contact surfacing (A-Frame, Dog-walks and Teeters) have been painted wood with embedded sand over an aluminum frame, though in the last few years we've seen a lot more rubber surfaced contact equipment which provides significantly more traction for the dogs - especially in bad weather. Dogs don't need to touch the yellow part on the way up - but they MUST touch the yellow with at least a toenail in the yellow part (and the judge needs to see the toenail in the yellow). Some smaller dogs will naturally run into the yellow - big dogs though often need an end behavior to ensure that they "get into" the contact zone. A regulation dogwalk is comprised of three 12' long boards - two ramps to a center board with the center board set at about 4' off the ground. Dog-walks are relatively narrow - 12" wide. Once again, dogs must touch the yellow part of the contact as they descend the down plank. The teeter or see-saw is also 12' long and 12" wide, the mid-point of the teeter is 24" off the ground - and the center support MUST be visible on either side of the plank. Dogs must remain on the teeter until the board hits the ground on the other end. Failure to do so is a missed contact - or a fly-off. 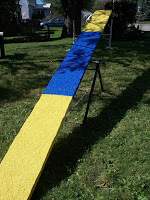 We just rubberized our home teeter a few weeks ago - it was quite the interesting project! The pause table is a required obstacle in the standard classes. Dogs must jump onto the table and hold their position for a count of five seconds. Sliding off the table or jumping off before the judge releases the team is a fault. Table heights vary by height of dog - in AKC the 4", 8" and 12" jump heights have an 8" table, the 16" and 20" dogs have a 16" table and the 24" and 26" jump heights have a 24" table. That's a pretty high level overview of what the sport of agility is - what about "your" dog - would he like to play agility? Could he? Dogs of all shapes and sizes can learn agility - from the very small to the very tall all dogs can play the game. For some dogs the objectives need to be a little different - a 120 pound newfoundland will never be as fast as a 35lb border collie - the two breeds were bred for very different purposes (by the way, we probably won't ask that 35lb border collie to rescue captain and crew out of a whirling ocean). For most agility addicts, competition isn't why they play with their dogs - it's about building a relationship with your dog, spending time with other people who like their dogs and learning new things. When I step to a startline - practice or competition I'm looking at the puzzle (course) ahead of us - can we put the pieces together as a team and get through the course without any mistakes? As an instructor, I've seen dogs make remarkable transformations once they gain confidence on equipment. The same "I can do that" attitude that a dog needs to launch over that teeter helps shy or under confident dogs become more confident off the agility field...They've learned to learn and they've learned to think! I love those lightbulb moments! Before you start, check with your vet - most intro to agility classes emphasize skills over jump heights, but you need to start with a fit and sound dog. Make sure that your dogs nails are trimmed to prevent toe and ligament injuries. Before I start my young dogs I like to have x-rays to know what they look like orthopedically before I ever ask them to jump. What else should I know to get started? Check out this link - Basic obedience for agility dogs. **On a side note, I realized that I don't own (as in the rights to) many good agility shots of my dogs! I have this super photogenic dog - who's amazing in shot after shot - and I don't own any of those amazing shots! Clearly I need to arrange an agility photo-shoot with the boys to get some good shots! Hi there! I was so excited to see this post on Pawcurious. As a recent agility addict who is hoping to enter her first trial in the spring, I am always looking for new resources. I'm now going to be spending a lot of time going back through your archives. Thank you so much for taking the time to share all of this great information. Your dogs are absolutely beautiful.